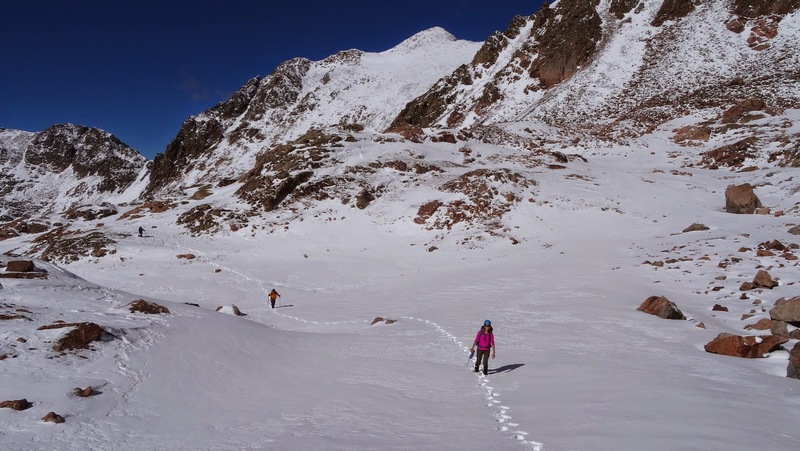 The hike in from the Gore Creek trailhead at 8700' had been an arduous one thanks to recent snowfall. Our group was the first ones breaking trail through the fresh snow. I was in my summer boots which was a bad choice. I had also delayed putting my gaiters on until too late, which was clearly another bad decision. As a result of these two bad decisions, I found myself with annoyingly wet boots from the wet snow before we even reached Deluge Lake. We had also gotten a later start than I would've liked, starting at 6:40am. The recent snow slowed our pace and it was deep in spots above 10,000'. 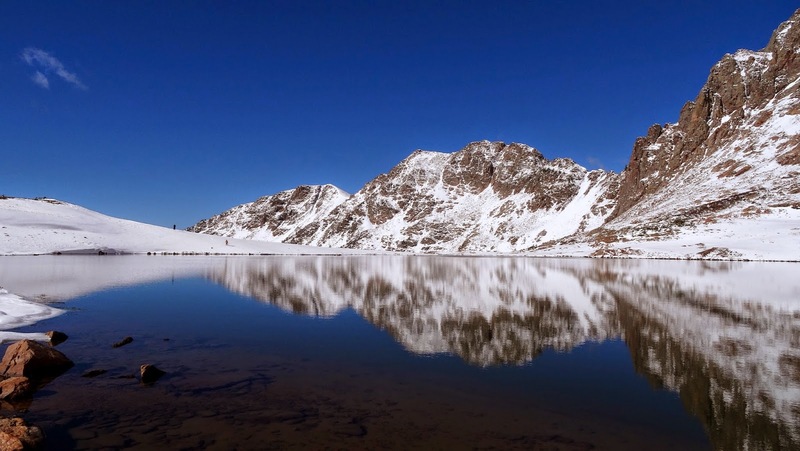 The snow ranged from a few inches deep on the trail at 10,000', to two feet deep above the lake. 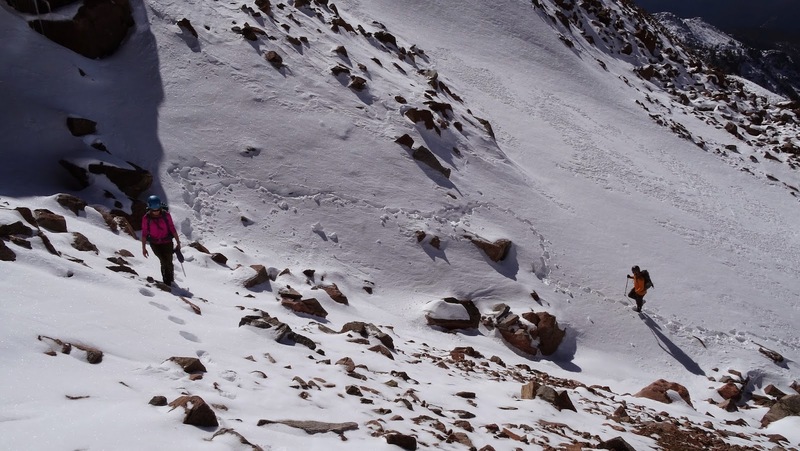 As a result of the slower pace, we found ourselves at 12,400' when noon rolled around. Dan was on his first hike ever in the snow. He was also learning some tough lessons about gear choices, which I think many of us had to learn from experiences. Anyways, Dan was nearing his exhaustion limit and as a result was contemplating turning back. I could see the determination to reach the summit in Mark's eyes and knew that he was stopping at nothing today. Cynthia was to join him on his quest for the summit. The determination was a feeling I've had myself on numerous occasions, yet not today. Today, I saw this determination and wished I could summon some in myself. I did not. So, I decided to turn back at 12,400' with Dan. I stopped partially because I did not want to leave Dan alone and thought it might be a safety gamble to continue with him as exhausted as he was. But let's not hide the truth. The truth is, I turned back mostly because I myself was being a big wuss. I just wanted the sufferfest to end. The nearly 4000' of elevation gain thus far in these conditions had worn me out. My feet were cold, I was exhausted, and I also hated the idea of hiking out in the dark and not seeing a plate of real food till potentially 9pm. The snow combined with the terrain was making the hiking real slow. Snow was covering talus which meant the occasional step that would plunge through the slushy snow into a hole between the rocks that was deep enough to swallow a person if you weren't careful. Now, as I sit at home, in the warmth of my living room, I can easily second guess myself and kick myself repeatedly for turning around so close to the summit. I just lost the mental battle on Valhalla Peak. The only reason I did not summit Valhalla Peak is because I didn't push myself hard enough. The above statement is bolded as it is intended to remind me as much as it is to remind my readers that mountaineering is so much of a mental game. Regardless of the learned lesson that came with this failed summit bid, the hike up to Valhalla Peak and Deluge Lake was great on many levels. I got to spend some time with people I really enjoy. Dan, Mark, and Cynthia were all great hiking companions. I'm sure we'll all share a summit together someday. The weather was amazingly good with only light winds. The area around Deluge Lake was astonishingly beautiful, particularly with fresh snow. I got to work on my photography skills - I'm still learning in this area too. A summit is not an ingredient for creation of good memories. Mark and Cynthia with Valhalla looming behind them in the distance. Snow Peak as seen from Deluge Lake. Pic looking back at Deluge lake from about 12,400' where I turned around. Dan falling in the snow on the descent. This got a good laugh. Pic of an awesome cabin that's close to the lake. I might have to stay here sometime. The view out the front door of the cabin. The best part of any hike is the friendships formed along the way. Dan (left), me (orange), Cynthia (pink), and Mark. Aspens and blue skies. I love Colorado. One other fond memory of this day that I do not have pictures from was our group dinner and beers that followed. Good times! Can't wait to get out again with this crew.